Rather than trying to discourage high school students from using illegal anabolic steroids, former Mr. Universe, Tom Platz, offers explanations and excuses on why these people (who are “predestined” to be bodybuilders) resort to using these drugs. He equates steroid use in body building with the use of caffeine and aspirin by the CEOs of businesses! What fine messages to send to our kids! Adults, listen closely to the messages that are being sent to our kids. Begin to internalize WHY WE NEED TO BE TALKING TO OUR KIDS ABOUT THE DANGERS OF APEDS. Know that others are talking to our kids sending some pretty questionable messages, and our children are listening. 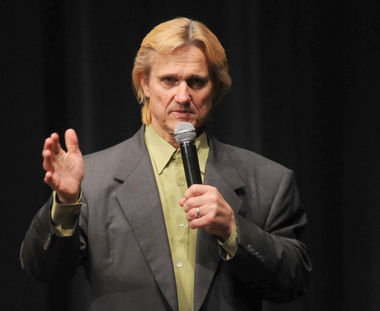 Recounting days of competition and hours spent pumping iron with other greats such as Arnold Schwarzenegger, bodybuilding legend and former Mr. Universe Tom Platz fielded questions from the audience during a seminar at Grandville High School Sunday. An add-on to Mike Vruggink’s NPC Grand Rapids Bodybuilding Championships on Saturday, the seminar gave participants an inside look at the fitness business from one of its heralded members. Platz, who was raised in Michigan and earned degrees from Wayne State University and Michigan State University, spoke fondly of his powerlifting days among strong Michigan gym mates. He’s currently helping Maximus Fitness owner and West Michigan bodybuilder John Pitsch with his quest to earn his pro card. Questions from the audience focused on healthy eating tips, how much time off to take after competing in shows and the oft-taboo subject of steroids. Platz said he would tread lightly but truthfully into the subject with the crowd, offering his take on the status of the pro sport. Platz explained that steroids won’t help competitors learn to pose, won’t create a stage presence for you and certainly doesn’t help create the professionalism you need to compete at the top. One large ingredient, Platz said, is the family atmosphere the gym represents to the bodybuilder and every-day weightlifter. It helps keep them dedicated to their craft.